A vast apartment with up to 6 bedrooms and expansive living space - one of the largest suites in London. The Presidential Residence occupies a whole floor of 380 square meters/4,000 square feet with one, two and three bedroom Presidential Suites which can be interconnected to create an opulent and contemporary six bedroom residence. 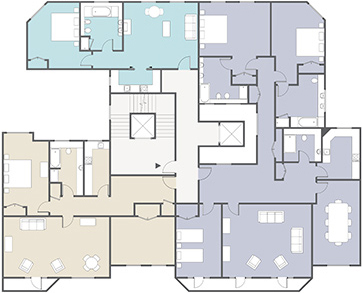 The floor features a private doorway, leading to a spacious hall with three separate entrances into each suite. The Presidential Residence is 306 square meters /3,292 square feet. The first suite is 167 square meters/1,797 square feet in size, consisting of three double bedrooms each with an en-suite bathroom, a very spacious sitting room, separate dining room and a fully equipped kitchen. This section of the suite also has views overlooking our beautiful award-winning courtyard. The second suite is 74 square meters/796 square feet in size, consisting of two double bedrooms, one with an en-suite bathroom; one with a separate bathroom, plus a spacious sitting room and a fully equipped kitchen. The third suite 65 square meters/ 699 square feet, consists of one double bedroom, a sitting room, a fully equipped kitchen and a bathroom.